Province Name: Xinjiang Uygur Autonomous Region (hereafter Xinjiang). Area: 1.6604 million square kilometers. Surrounded by lofty mountains, Xinjiang is known far and wide as the home of fruits and melons. Its main agricultural produces include wheat, corn, cotton and plenty of fruit like Hami melon, grape, fig, Ili apple, etc. Being one of China's five major pastoral areas, it has advanced livestock breeding. It also has rich resources of petroleum, bowlder, gold and nonferrous metals. It can at the same time claim to be the driest, hottest, coldest and largest province of China. However, it is the unparalleled scenery, and cultural diversity, which has drawn explorers and travelers to this spectacular region.Today, when you travel to Urumqi, Xinjiang, you will soon find it has become the new hotspot on the adventurer and tourist list... a must see place to visit within China.It offers fantastic opportunities for those with an interest in nature, open spaces, deserts, mountain fresh air... all hoping to catch a glimpse of ancient but rapidly changing cultures and customs of the Silk Road. Its two major deserts, the Taklamakan and the Gobi desert are separated by the mighty Tian Shan range, which stretches East-West unbroken for nearly 2,500km, bringing life sustaining water to the oasis towns and villages along its flanks.In the Northern Altai region temperatures tend to be cooler than the south, and this is characterized by its amazing array of flowers and vegetation through this mountain region. Extremes range from 50°Celsius in the summer to -50°Celsius in the winter.Being a place of such climatic extremes, it is this, that generally dictates when and what to do. When you come to see and travel Urumqi and Xinjiang, the local climate endures hot, dry summers, and cold dry winters, typical of its continental location. Spring and fall are shorter while summer and winter are quite long. If visitors can't stand the low temperature, the best time to travel to Urumqi and Xinjiang is from May to October.Xinjiang has many inland rivers and only one, the Irtysh, flows to the sea. The worlds second highest mountain, K2 (8,511m), is situated on Xinjiang's southern border with Pakistan, and its lowest point, the Turpan depression (-154m) is also the second lowest place on earth. Xinjiang has had a turbulent history. It first passed under Chinese rule in the 1st cent. B.C., when the emperor Wu Ti sent a Chinese army to defeat the Huns and occupy the region. In the 2d cent. A.D., China lost Xinjiang to the Uzbek Confederation but reoccupied it in the mid-7th cent. It was conquered (8th cent.) by the Tibetans, overrun by the Uigurs, who established a kingdom there, and subsequently invaded (10th cent.) by the Arabs. Xinjiang passed to the Mongols in the 13th cent. An anarchic period followed until the Manchus established (1756) loose control. The subsequent relations between China and Xinjiang were marked by cultural and religious conflict, bloody rebellions, and tribal dissensions. In the 19th cent., this unrest was encouraged by Great Britain and czarist Russia to protect India and Siberia, respectively. Xinjiang became a Chinese province in 1881, but even as late as the establishment of the Chinese republic in 1912 it remained more or less independent of the central government. Rebellions in 1936, 1937, and 1944 further eased Chinese rule.Late in 1949, Xinjiang capitulated to the Chinese Communists without a struggle, but there was a Uigur uprising in Hotan in 1954. On the basis of the 1953 census, which showed the Uigurs to comprise 74% of the population, Xinjiang prov. was reconstituted (1955) an autonomous region. Autonomous districts were created as well for the Kazakhs, Mongols, Hui, and Kyrgyz. In the 1950s and 1960s, the central government sent massive numbers of Chinese to Xinjiang to help develop water-conservancy and mineral-exploitation schemes. This has drastically altered the population balance, and the Chinese are approaching numerical parity with the Uigurs. National defense has also been a consideration in the strategic and sensitive region. In 1969, frontier incidents led to fighting between Soviet and Chinese forces along the border.In the 1990s, the Turkic peoples of Xinjiang grew increasingly discontented with Chinese rule, and rioting by proindependence Muslims broke out in 1997. China subsequently increased the number of troops in the region, and has instituted a harsh crackdown on political dissent and Turkic separatists. Orthodox Islamic practices have been discouraged or suppressed by the government for fear that they will become a focus of Uigur nationalism. The great Altai, Tian Shan, and Kunlun mountain ranges enclose the region on the north, west, and south, respectively; a barren plateau lies to the west. Xinjiang's rivers, including the Tarim, Yarkant, Ili, Manas, and Hotan, rise in the mountains and flow from east to west. The level land, divided by the Tian Shan in central Xinjiang, comprises Dzungaria, a grazing region to the north, and the Tarim basin (Taklimakan), a vast desert to the south. Lop Nur, a largely dried-up salt lake in the Tarim basin, is the site of Chinese nuclear test explosions. Xinjiang has a dry continental climate with great extremes of winter and summer temperature. Rainfall is scant, seldom exceeding 10 in. (30 cm) annually.Xinjiang is ethnically diverse, with mainly Muslim, Turkic-speaking Uigurs making up nearly half the population. There are also Hui, Mongolians, Manchu, dozens of other minority groups, and a growing Chinese population. Most people live along the borders of the Dzungaria and the Tarim basin. Xinjiang Univ. is in Ürümqi. In the most populated areas cotton and silk (both locally spun and woven) are produced and wheat, rice, millet, potatoes, sorghum, sugar beets, and fruit are grown. Uigurs have traditionally excelled in building the intricate systems of canals and wells that supply water to the fields. The Manas irrigation project in S Dzungaria is one of several extensive modern government attempts to expand the area under cultivation. Although extensive areas of grazing land have been converted to raising wheat, large-scale animal husbandry remains important, and the number of livestock (sheep, goats, cattle, horses, and camels) is increasing. Many of the Kazakh and Mongol stock-herders are still at least seminomadic.Although Xinjiang is predominantly agricultural and pastoral, it has rich mineral resources. The vast oil fields at Karamay (served by both highways and an airline) are among the largest in China, and there are extensive deposits of coal, silver, copper, lead, nitrates, gold, and zinc. New mines as well as associated industry, such as refineries, ironworks, steelworks, and chemical plants, have been established. Other industries include textile (the region produces large quantities of cotton and wool) and cement production and sugar refining.The region is linked to the Chinese rail network by line from Lanzhou, Gansu, to Ürümqi (completed 1963). West and south of Ürümqi transportation is mainly by highways built along two ancient roads: the north road, which skirts the southern edge of the Dzungaria and connects Ürümqi with the Turkistan-Siberia rail line, and the south road, encircling the Tarim basin. The camel remains an important means of transport, but the use of trucks continues to increase. 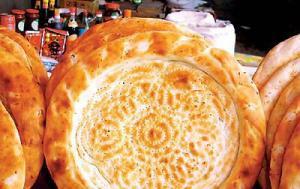 Like the ethnic community that created them, Xinjiang dishes are bold in style. Lambs are roasted and served whole, pancakes are presented in the shape of a tower, and rice is eaten with the hands. They are hard to resist because of their delicious taste. A foolproof place to find restaurants serving the original prairie flavor is in Xinjiang Uygur Autonomous Region Representative Office in Beijing. The compound is a 50s' Soviet-Union style mansion with an impressive garden, while several Xinjiang restaurants with different price ranges are located here, which make the lace a favorite spot for either Xinjiang migrants to relieve their homesickness for food, or the locals who love the exotic flavor. 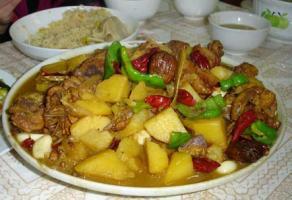 Xinjiang cuisine really excels at the preparation of mutton. One yuan for a Mutton Kebab is a popular deal at these restaurants. Kebabs are crispy outside and tender inside, slightly salty and hot. They are not greasy and have no unpleasant smell. To accompany your kebab, try a special flatbread with a golden yellow crispy crust called Nang, which is the staple food for the Uygur. Xinjiang Salad made of fresh tomato, onion, green pepper and coriander is also delicious, especially in this sweltering weather. "Shouzhuafan," which ans "rice eaten with hands" in English, is another dish that must be sampled. The main ingredients are rice cooked in mutton broth with spring onions, carrots and a piece of mutton placed on top of the rice. The dish irich enough to give it an undeniably delicious flavor despite leaving you with a greasy hand. Roast lamb, considered to be the "king" of Xinjiang cuisine, is usually the most expensive course on the menu. A two-year-olsheep is slaughtered and skinned, daubed with salt inside and outside, and then coated with a mixture of eggs, chopped ginger and scallions, and pepper. The sheep is put into a stove to roast for about an hour until it turns golden brown.